This blog is getting a new home! Next month will mark the 135th anniversary of the founding of the American Library Association in Philadelphia in 1876. I thought I would take a look back at some of ALA's previous significant anniversaries in a lead up to that important milestone. 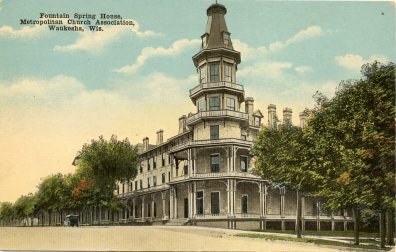 ALA was 25 years old when it met at the Fountain Spring House (see postcard above) in Waukesha, Wisconsin in 1901. There wasn't a lot of hoopla at ALA's 23rd annual conference (there were no meetings in 1878 and 1884) related to its silver anniversary. President James Carr did make note of the anniversary in the president's annual address and reported that there were now a thousand members of the association. That number included sixty-nine of the original charter members of ALA. The Waukesha conference had the second largest number of attendees at a conference up to that time, a total of 454. The conference ran from July 3-10 and overlapped the Fourth of July which was kept free of general sessions. Monday, July 8th, was designated as "Madison day" and more than 300 attendees boarded a train for the Wisconsin Capital where they were met by carriages that took them on a tour of the city. A highlight of Madison day was a visit to the recently completed building of the State Historical Society of Wisconsin which housed both the Society's library and the library of the University of Wisconsin. A contemporary report of the ALA Waukesha conference was published in the July, 1901 issue of Library Journal. 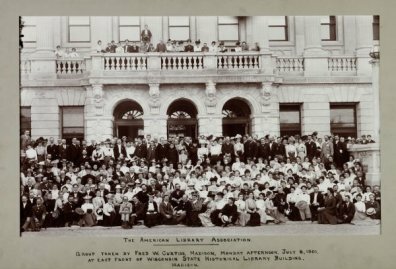 The image of the ALA conference attendees in front of the State Historical Society of Wisconsin building in Madison, WI is from the Wisconsin Historical Society Digital Collection (Image ID 45544).